The simplest way to find duplicate files in a directory is to press the 'Duplicates' button located in the top-left corner of the main toolbar. On the profile dialog enter one or more disks or directories to search in and press the 'Search' button to begin the search process. Depending on the amount of files that should be searched, the duplicate files detection process may take from a couple of seconds for tens of files to a few hours for large file systems containing millions of files. During the duplicate files detection process, DupScout will display the process dialog showing the total amount of processed files, the number of detected duplicate files and the amount of the wasted storage space. Once the detection process is completed, DupScout will display the list of all detected duplicate file sets sorted by the amount of the wasted storage space. For each duplicate file set, DupScout shows the name of the currently selected original file, the currently selected cleanup action, the number of duplicate files in the set, the size of each file and the amount of storage space wasted by the duplicate files. 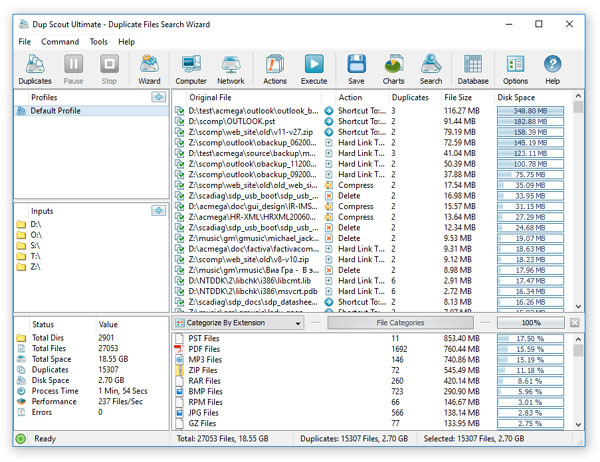 Sometimes, there may be thousands of duplicate files and in order to help the user to concentrate on duplicate files wasting significant amounts of disk space, DupScout by default shows top 10,000 duplicate file sets sorted by the amount of the wasted disk space. 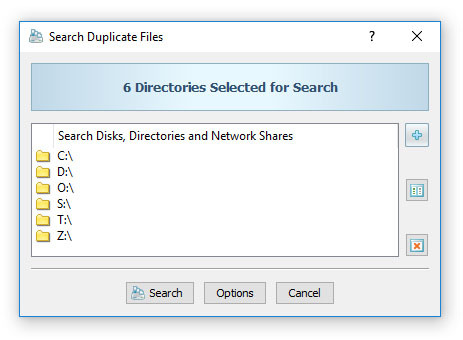 In order to change the default number of displayed duplicate file sets, open the duplicate files search options dialog, select the 'Options' tab and set the 'Max Dup File Sets' option to an appropriate value.